New York City is a proud and beautiful city. The courage and bravery New Yorkers show is known across the world. 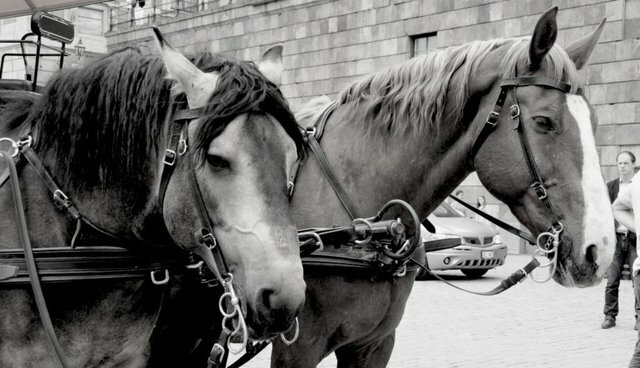 Unfortunately, New York City is also home to an inhumane industry of horse-drawn carriages. Animal advocates are not seeking to ban the carriage industry but transition it to an exciting, cruelty-free and horse-free future. Horse-drawn carriages simply do not fit in an urban environment like New York City. The horses are forced to tolerate dangerous journeys through some of the most congested streets in America; enduring rush hour traffic, vehicle exhaust and uneven pavement riddled with potholes. They work nine hours a day and live their lives in tiny stable stalls with no access to green pastures. The horses are easily "spooked" by objects and the loud noises of the city, which cause them to take off and run out of control through traffic. This has caused accidents, inflicted great damage on vehicles and drivers and resulted in the death of the horses. It pains me to say that yet another carriage horse was hurt on April 29, 2014. The horse was spooked by a bus passing by, flipped the carriage and fell to the ground across from the Plaza Hotel. The inhumane treatment of these beautiful, sentient beings needs to be stopped. The cruel reality these horses live is not romantic or dignified; it's tragic. I assure you, we do not want to take jobs away from people. No horse carriage drivers have to lose their jobs; they could transfer their current medallions to horseless-carriage medallions. The entire transition will take three years to complete and be transformed. In addition, NYCLASS has committed to providing the retired horses loving homes on private farms and in sanctuaries; no horses will be slaughtered. I grew up in New York and I love New York City, but seeing such an inhumane industry continue to operate here is disheartening. I strongly support the efforts to retire horse drawn carriages and to replace them with humane, job-saving electric vintage replica tour cars. Such a heroic decision will be heard and felt worldwide. I am putting my weight behind NYCLASS and other welfare groups to get these horses out of the anguish they are living in. The residents of New York City are ready to see a change, and it needs to happen now. How many more horses have to be injured or die and how many more years does this form of "slavery" have to exist? By standing firm and providing a humane solution for all, everyone will win, including the horses.